Lentils are one of the cheapest and most nutritious vegan foods you can eat. The great thing about them is that they can be prepared in so many different ways so they never get boring. Lentils are a staple in India, so you can always find some good Indian recipes which call for lentils. If you are a really poor vegan, then just throw together some lentils and potatoes with curry powder and you’ve got yourself a cheap, yummy and nutritious dish. Just sauté the veggies until they are soft and use a bottleneck blender to mix them in with the cooked lentils. If you find your fridge empty except for a lone carrot, stalk of celery, and a potato, just add some lentils and you have the makings of a delicious vegan soup! Lentil soup is one of the cheapest meals you can make and is especially great in winter to warm you up. Add a big handful of chopped fresh parsley (or use another green, like spinach or kale). Let it cook until softened. Remove veggie mixture from heat and let cool. Add veggie mixture to cooked lentils. Form balls or patties with your hands and fry them until browned. Serve as is, in a sandwich, or topped with a delicious sauce. ***You can really experiment with the amounts of each ingredient. I generally use ½ cup veggies, 1 cup lentils, ¼ cup bread crumbs. You can also bake these balls too. Macaroni and other pastas are one of the cheap vegan fallbacks. But eating just macaroni is a sure path to nutritional deficiencies! Add some nutrients (and excitement) to your macaroni by adding some lentils. It can be as simple as tossing them on top of that instant vegan mac-and-cheese or a culinary sensation like this lentil and sundried tomato spaghetti. Pancakes don’t have to be sweet, nor are they just for breakfast. One of my favorite standby recipes is pancakes with lentils and veggies. Just mix up the pancake batter and then add some cooked, chopped veggies and lentils. ***By hiding veggies in pancakes, I get my vegetarian toddler to eat anything! You can basically take any “stuffed” recipe and add lentils to the mix. 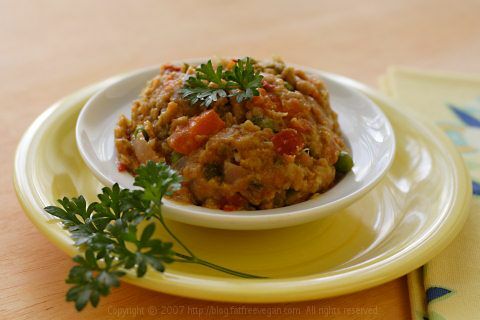 For example, you can easily veganize this simple stuffed pepper recipe by using lentils instead of beef. Lentil Tip: Dry lentils are much cheaper than the canned variety. It can be a pain to cook lentils (especially if you are hungry now or just cooking for one). My solution is to cook tons of lentils at once. Then I divide them into portions, put them into baggies and put them in my freezer. When I want to cook something with lentils, all I have to do is take them from the freezer and let them defrost in warm water for a few minutes.